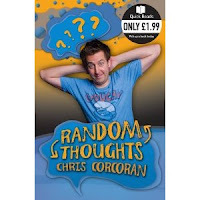 Chris Corcoran is a teacher-turned-comedian and children's television presenter. If you are very young (in which case, why are you reading this blog?) you may have seen him on CBeebies Doodle Do. If you're a bit older, you might have seen him co-presenting The Rhod Gilbert Show. That's quite a CV he's got. So I'm thinking: "This bloke should be funny. He's written a book about random stories he thinks are funny and entertaining for Quick Reads. Funny AND short. Just what I need at this stage for a book a week in 2010." At his best, the 'Radio Ga Ga' chapter evokes memories of the school disco, crap songs, youthful inebriation, and child-like priorities. 'Dragon Cabs' and 'Up in London' poke a gentle stick in the side of the Welsh and those from the Valleys (he grew up in Pontypridd, so it's allowed). At worst, we have a pointless musing in the chapter on 'Health Food Shops'. And the 'I Love Sian Lloyd' chapter should never have made it into print. Some gentle humour, but overall a bit hit and miss.